Nearly 100 years ago, Dr. Maria Montessori, one of Italy’s first female physicians, became interested in the field of education while caring for mentally challenged children in a psychiatric clinic in Rome. There she combined sensory-rich environments and hands-on experiential techniques in the hopes of ‘reaching’ children previously written-off as undesirable by the educational system. Her assumptions proved enlightening, and in a short time, Montessori’s students were able to overcome their handicaps and pass Italy’s standardized public school tests. 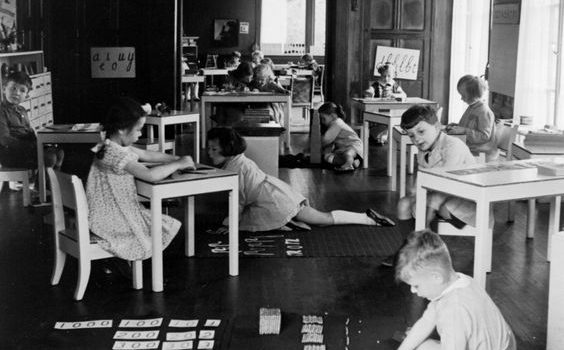 The resounding success brought Montessori a good deal of attention, and, more importantly, drew focus on the innovative practices that had resulted in such positive learning behaviors from children previously left behind by society. 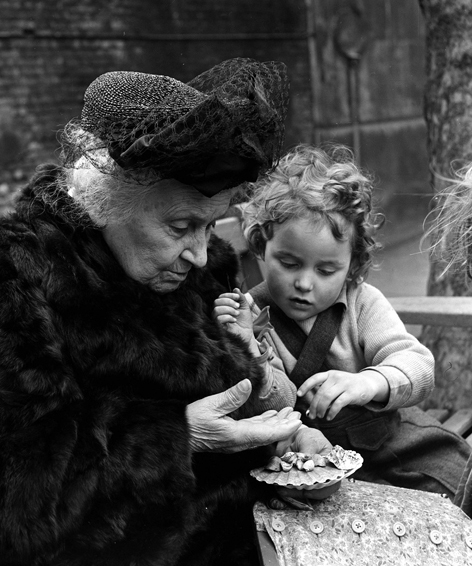 Shortly thereafter, Montessori continued shaping her learning model by opening “A Children’s House” for pre-school children living in the slums of San Lorenzo. With her scientific background to guide her, she observed that young people learn best when engaged in meaningful and purposeful activity. In tune with that notion, hers became a world in which children were guided by curiosity and experience, as opposed to one defined by lecture and rote. Over time, and further drawing upon her clinical impressions of children’s cognitive growth and development, Montessori put into place an educational program whose goal was to respect individuality and to strive to fulfill the needs of the “whole child.” Dr. Montessori’s pioneering and lifelong work created a blueprint for nurturing children – from the disabled to the gifted – to become the self-motivated, independent, and life-long learners that are society’s ultimate goal. Since that time, Montessori’s philosophy, materials, and practices have spread around the globe and have been implemented throughout mixed and varied cultural settings. Even today, over 100 years later, Dr. Montessori’s visionary ideas continue to flourish and adapt to meet the needs of a new millennium. Her pedagogy has literally spanned the globe, and – though Montessori’s teachings were slow to establish themselves across the Atlantic – there are now thousands of Montessori schools in the United States alone, where interest in enrollment continues to increase each and every day. In our mission statement, Von Wedel Montessori School commits to preparing our students to be constructive contributors to the greater community (and society at large) by focusing not only on each student’s academic development, but his or her personal and social development as well. We recognize that children have a desire and propensity to learn, and, given the proper environment, will develop intellectually, socially, emotionally, and physically. This proper, or “prepared environment,” as Dr. Montessori called it, includes not only the classroom and its many materials, but the overall social setting and atmosphere as well. It is imperative that all these come together in their support of the growing child. At Von Wedel, we provide a child-centered, individualized approach to teaching and learning. We welcome each child’s differences and immerse our students in mixed-age, multi-level, multi-grade classrooms that help to ensure that “no child is left behind.” Our program design draws a great deal from Dr. Montessori’s beliefs about education, and the result is a school that is somewhat distinguished from many of its counterparts in South Florida. Montessori education is built upon the tenet that all learners are individuals – in style, pace, and interests. At Von Wedel, we allow students to make choices for themselves, encourage them to become a more active force in their learning, and afford them the opportunity to reflect on and assess their growth as individuals. This differentiated instruction, integral to individualized learning and essential in Montessori education, is designed to foster a sense of student ‘ownership’ over the educational experience and to engender a more positive academic experience. Each student is expected to progress, without self-consciousness, at his or her own rate: either moving ahead without having to wait for the rest of the group, or staying on task and taking the time he or she needs to internalize a certain piece of material. At Von Wedel, students are grouped into mixed-age classes that typically span two to three-year intervals, depending. These mixed classrooms empirically provide numerous benefits, including a greater range of curriculum options and reduced competition between peers. Through teaching and tutoring one another, children gain confidence and competence, cooperation skills, and a sense of community between each other that fosters stronger ties to the classroom, and – consequently – more positive feelings toward the school setting as well. Furthermore, beyond the benefits to the peer-based experience, looping students with teachers for multiple years also gives the teacher the gift of being able to grow with the student; eases the transitions into new academic years (and levels of instruction) for students who return to a familiar and trusted environment; and enables both student and teacher to better focus on the learning that needs be done. 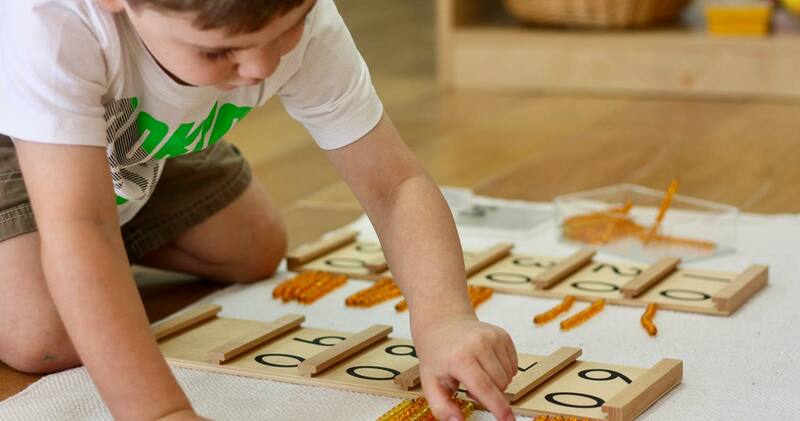 Montessori instruction progresses from concrete explorations and concept development to abstract undertakings. Von Wedel’s classrooms are designed with an abundance of carefully sequenced Montessori materials to support each student’s fundamental learning progression. 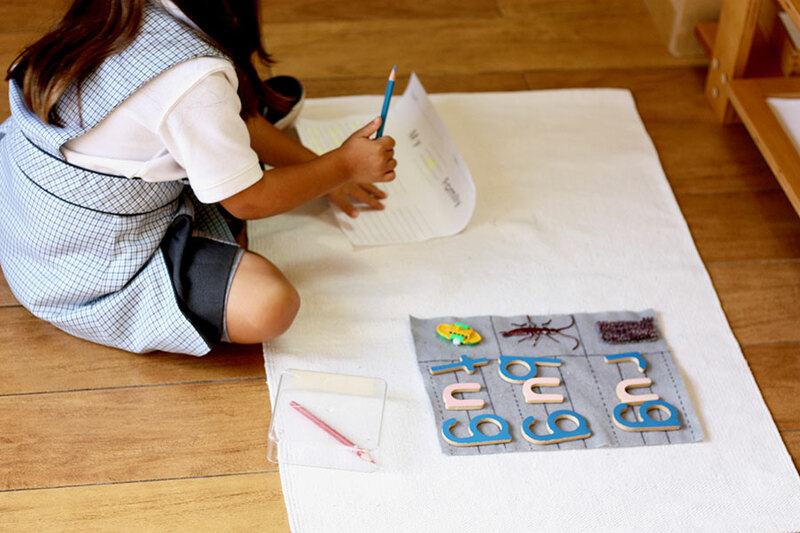 We believe that one of the essential components to inquiry-based learning is the Montessori principle of long uninterrupted blocks of work time designed to enable students to explore a topic or material as needed to progress toward achieving mastery. During such work periods, whole-class instruction is kept to a minimum, and is replaced with lessons being given to specific individuals or to small, interactive groups. This approach fosters an environment characterized by independent learning and increased attentiveness to one’s responsibilities, and is typically supported adult guidance to help students keep “on the right track” as they go about their lessons. At Von Wedel, our Montessori teachers are facilitators who support learning through careful observation of each child’s behavior and growth and who translate those observations into subtle guidance through changes in the student’s immediate environment, invitations for inquiry, and direct instruction. Our teachers use their knowledge of each child’s interests and abilities to encourage them to new content areas and to areas of increasing challenge and difficulty as they master preliminary skills and show signs of readiness to move on. We work to create and sustain a classroom and school culture where demonstrations of respect, initiative, risk-taking, and persistence in learning are the norm. The Montessori classroom is not only a community of close friends and companions, but also a source of countless “life lessons” in social skills, everyday courtesy, and ethics. Teachers at Von Wedel use their understanding of child development theory and the sensitive periods at each stage of growth to integrate character education into the learning program. Classroom life reflects the values of respect, honesty, responsibility, self-control, tolerance, kindness, citizenship, cooperation, and environmental stewardship. Teachers serve as models for these values and students emulate them as they interact with other members of the school’s diverse community. As our students grow and mature, they prove to not only enjoy each other’s company, but naturally learn from each other as well. We capitalize on this tendency and operate as small communities in which students work together, resolve conflicts peacefully, encourage and acknowledge each other, and work as committees to complete tasks. Our classrooms, at times, appear to be run almost entirely by the students, with the teacher as just another member. They keep the room in order, care for any classroom pets, tend to the plants, and even – as they grow older – organize special events for friends and neighbors. 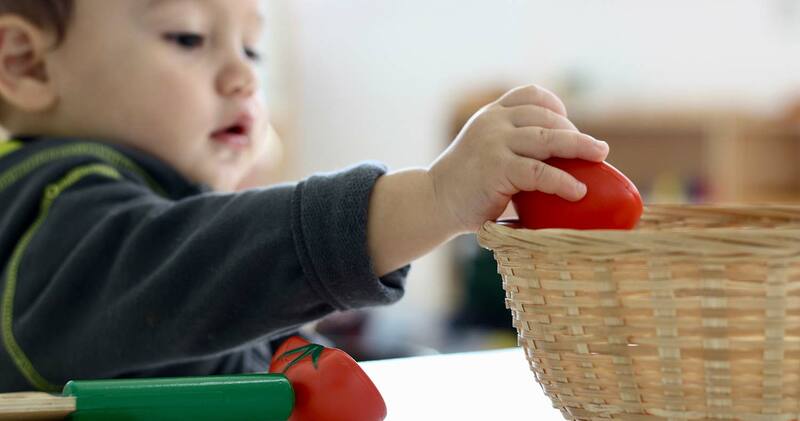 Montessori tenets are, in part, predicated on the notion that as children grow they learn in and contribute to increasingly expansive and diverse human and environmental communities. Students at Von Wedel first come to understand the world and their part in it by discovering community within the classroom; then by contributing to the life of the school and caring for the surrounding plant and animal habitats; and, finally, by learning about environmental stewardship and supporting the improvement of the neighborhood and the larger community beyond the school’s walls. Charity and service are higher-order goals that are naturally integrated in the curriculum. Montessori is an educational philosophy and method of learning that has a rich history and an increasingly well-documented research base. Early in the 20th century, Dr. Maria Montessori envisioned a radically different approach to education than what was available in the Rome of her time: a practical approach akin to her own nature as a Doctor of Medicine rather than a Scholar of Education. As such, she was much less concerned with lofty ideology and academia than she was with results. For her, the question was very simple and focused, and her aim was both practical and pragmatic; she sought to develop a system of education that worked with children, rather than against them. During that search, and due – in part – to her nature, she was very willing to look beyond educational theory of the day, especially when confronted with the reality that ‘current’ theory was failing to effectively address children’s needs. In the end, she looked for answers inside herself and turned to what she knew; deep down, Dr. Montessori was a scientist – a physician concerned with treatments to aid health and well-being. Though there were undoubtedly times and instances in which her personal views got in the way of true objectivity, Dr. Montessori’s major ideas about ‘treatments’ that bring about more optimal learning and development, as derived from her empirical observations, are now – over 100 years later – being upheld by ever increasing and more in-depth research in today’s world. If one has read some of Maria Montessori’s work, and one is reasonably familiar with current perspectives in developmental psychology and education, it is obvious that Montessori was a visionary in both fields. She anticipated many contemporary “child-centered” or “developmentally appropriate” educational practices and was an advocate for the active child when it was not yet fashionable. She understood the stage-like leaps made by young children and, like Piaget, understood the importance of sensory and motor activities as a foundational base for knowledge. Her grasp of the dynamics of teaching – not over- or under-challenging, helping only when necessary, and so on – is entirely consistent with contemporary Vygotskian perspectives on scaffolding and guided participation. Ideas such as multi-age classrooms and peer tutoring, a reduced emphasis on academic testing, stimulating a wider range of student interests, focusing on motivation and preparation for lifelong learning, and many other concepts that are integral to current educational debates, were discussed with remarkable clarity by Montessori. That order in the environment is beneficial to children. Over the next half-century, and the course of the rest of her life, Dr. Montessori adjusted and adapted her educational system to better serve children’s needs. The result is nothing short of a time-tried and tested program for, and approach to, instruction that now comprises over a century’s worth of empirical support. In contrast to other constructivists, Dr. Montessori left the legacy of a broad, field-tested curriculum covering all the major subject areas – math, music, art, grammar, science, history, and so on – for children ages 3 to 12. This system was developed by trial and error over her lifetime, with children in places as diverse as Rome, India, Spain, the Netherlands, and the United States. It has not been until the last two decades, however, that Montessorians have been presented with the kind of controlled and tested statistical analyses and studies needed to more fully step out from the periphery into the limelight. Although Montessori has traditionally enjoyed a quiet and dedicated following, and one which has steadily spread among members of scientific and academic circles in recent decades, it was not until a series of recent studies that Dr. Montessori’s flag could be unquestionably raised. 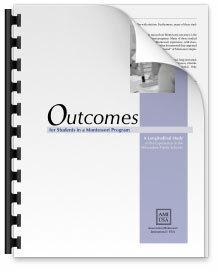 In 2003, Milwaukee Public Schools (MPS) and AMI-USA, the American branch office of the Association Montessori Internationale (AMI), jointly engaged Kathryn Rindskopf Dohrman and NCERI (The National Center on Educational Restructuring and Inclusion, the Graduate School and University Center, The City University of New York) to conduct a field study to evaluate the desirability of increasing the number of Montessori schools within the MPS system. Especially when given the weighted nature of the comparison group, the results of Dohrmann’s study are both remarkable and terribly relevant to any Parent considering educational options for their child. Children who were in the public Milwaukee Montessori schools from pre-school to Grade 5 scored significantly higher on standardized tests including the ACT and WKCE (Wisconsin Knowledge and Concepts Examination, a form of the nationally standardized Terra Nova, administered in the 10th grade) in math and science than did matched controls from their same high schools. Though further analyses of the collected data were and are underway, on all measures obtained to date, the Montessori group’s average score was either equal to or more positive than that of the non-Montessori children. A 2006 study published in the journal Science corroborated Dohrmann’s findings and concluded that Montessori students (at ages 5 and 12) performed better than control students who had lost a random computerized lottery to attend a Montessori school and instead went to a variety of different conventional schools. This improved performance spanned a variety of areas, including not only traditional academic ones such as skill with language and math, but social skills as well. On several dimensions, children at a public inner-city Montessori school had superior outcomes relative to a sample of non-Montessori applicants who, because of a random lottery, attended other schools. By the end of kindergarten, the Montessori children performed better on standardized tests of reading and math, engaged in more positive interaction on the playground, and showed more advanced social cognition and executive control. They also showed more concern for fairness and justice. At the end of elementary school, Montessori children wrote more creative essays with more complex sentence structures, selected more positive responses to social dilemmas, and reported feeling more of a sense of community at their school. Even more compelling is that corresponding studies are finding similar results – not only in terms of students’ academic performance, but by way of their emotional experience as well. 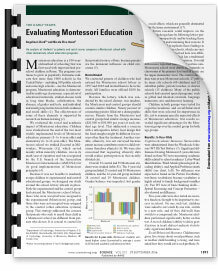 Researchers David Kahn and Kevin Rathunde in their separate studies on motivation and quality of experience both point to Montessori students reporting a significantly better quality of experience in their academic work than do their traditional counterparts, with Montessori students perceiving their schools as more positive communities for learning, with more opportunities for active, rather than passive, learning. The Rathunde study, for instance, employed the Experience Sampling Method (ESM) and multivariate analysis to show that Montessori students reported greater affect, potency (i.e., feeling energetic), intrinsic motivation, flow experience, and undivided interest (i.e., the combination of high intrinsic motivation and high salience or importance) while engaged in academic activities at school. 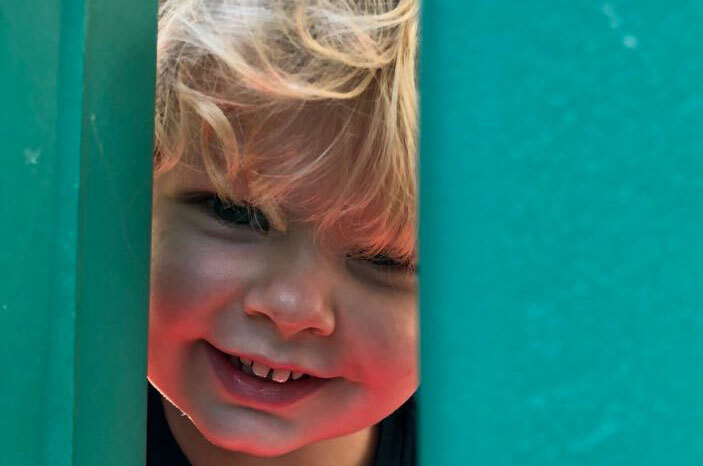 Taken together, the Milwaukee and Optimal Experience studies have opened a floodgate for the Montessori community, with modern evidence confirming what so many have known in their hearts for the past century. 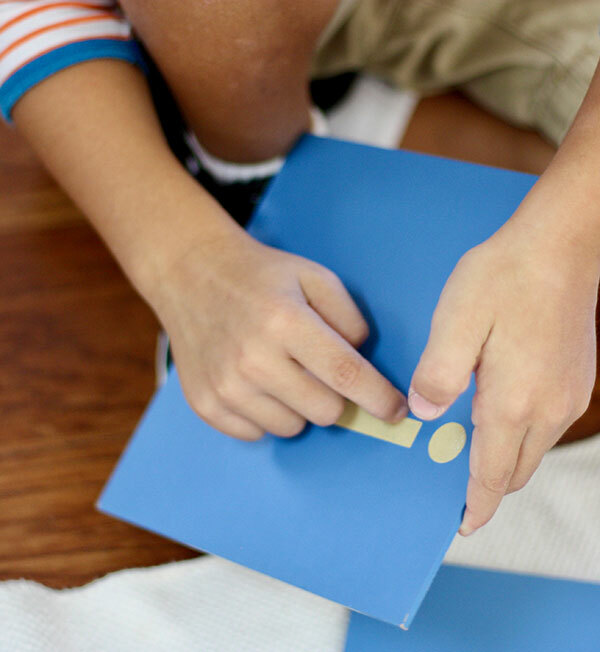 Not only does Montessori effectively provide for a student’s academic needs, but it does so in an environment, and through a Method, that is supportive, fulfilling, and leads to increased connectedness to peers, adults, and society at large.